The business valuation industry performed relatively well during the recent economic downturn due to a rise in bankruptcies that offset a low level of merger and acquisition activity. Growth is anticipated to continue at a strong pace in light of the vast number of U.S. babyboomers reaching retirement age who are considering the sale of their businesses, interest rates that are forecast to remain low, and a dramatic rise in activity in the healthcare industry. CPAs and other financial service professionals are uniquely positioned and highly qualified to provide business valuation services for these purposes. 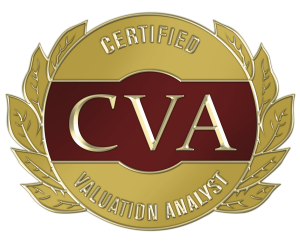 The CTI offers training in conjunction with the National Association of Certified Valuators and Analysts® (NACVA®) to provide the business valuation designation, Certified Valuation Analyst® (CVA®), through its Business Valuation Certification and Training Center (BVTC). The BVTC, taught in over 10 countries, is the most comprehensive and complete foundational training program teaching to the body of knowledge on how to value private business enterprises and assisting attendees in preparing for any business valuation certification. The CVA is the only business valuation credential accredited by the National Commission for Certifying Agencies® (NCCA®), the accreditation body of the Institute for Credentialing Excellence™ (ICE™). To help valuators as they advance in their business valuation skills, the CTI offers the Intermediate Business Valuation Training Center, Advanced Valuation: Applications and Models Workshop, Discounts for Lack of Marketability (DLOM) Workshop, Report Writing: Review and Analysis, Current Update in Valuations, Valuing Family Limited Partnerships Workshop, Industry Standards and Ethics, and many others.